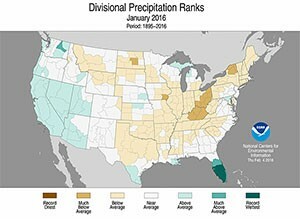 NOAA released their summary of climate conditions for January 2016 this morning. You can read the summary at https://www.ncdc.noaa.gov/sotc/summary-info/national/201601, with a link to the full report coming out later this week. They noted that this is the lowest amount of drought in the contiguous US since 2010. 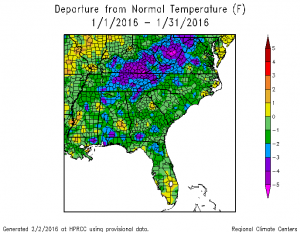 The USDA Southeast Regional Climate Hub published its latest newsletter today. 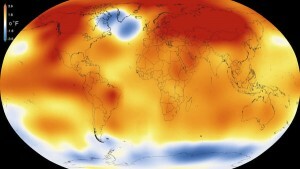 The issue has a list of several upcoming webinars related to agriculture and climate as well as climate summaries for December and for 2015. You can read it by clicking here. The latest climate summary for Florida is now available from David Zierden, the State Climatologist. 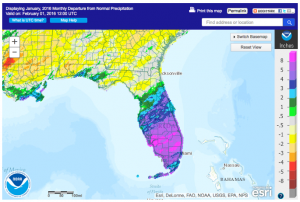 You can see it at http://climatecenter.fsu.edu/products-services/summaries/climate-summary-for-florida-january-2016. The climate summary for North Carolina for January 2016 is now available at http://climate.ncsu.edu/climateblog?id=176&h=5666e5c1. It also looks ahead to the weather patterns we are likely to see in February. Posted in Climate summaries, Uncategorized.